Japanese automaker Toyota has plans to launch its new fuel cell vehicle, the Mirai, in the United States in October of this year. The Mirai is powered by a hydrogen fuel cell, which produces no harmful emissions while generating electricity. The vehicle has been available in Japan since the end of last year, and Toyota has seen a significant rise in demand for this vehicle in that market. The Mirai may be somewhat less popular in the U.S., however, due to a lacking hydrogen fuel infrastructure. Fuel cell vehicles have become a hot topic in the auto industry. Consumers have been eager to purchase electric vehicles in order to become more environmentally friendly. Conventional electric vehicles, however, are often considered to be inefficient, which is why fuel cell vehicles are attracting so much attention. Fuel cell vehicles tend to have higher performance than battery electrics and can be fueled much more quickly than electric vehicles can be charged. One of the problems facing fuel cell vehicles is the lack of a hydrogen fuel infrastructure. These vehicles require a supply of hydrogen in order to operate, in much the same way conventional vehicles need gasoline. In the United States, hydrogen fuel stations are lacking, with the majority of these stations being based in California. The state has been heavily investing in the development of new fuel stations in order to support the adoption of fuel cell vehicles. By the end of 2017, Toyota intends to have 3,000 of its fuel cell vehicles in the U.S., making this number of vehicles in that market every year after that. 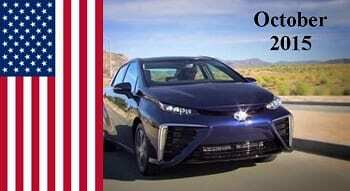 The initial price of the Mirai is set at $57,500, which will be reduced by subsidies that are meant to incentivize the purchase of fuel cell vehicles. These subsidies may help make fuel cell vehicles more attractive, as they will make them more affordable for consumers.